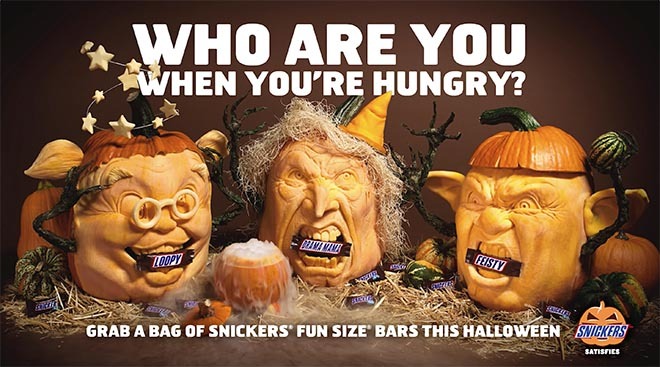 Snickers is connecting into the Halloween theme this year with “Hungry for Halloween”, a film featuring pumpkin carver Jon Neill. The film begins with the feel of a horror movie, complete with knives and what appear to be instruments of torture. All is revealed as Neill completes his work of art. The Snickers Hungry for Halloween campaign was developed at BBDO New York by executive creative directors Peter Kain, Tom Markham and Gianfranco Arena, chief creative officers David Lubars and Greg Hahn, creative director Kim Baskinger, senior copywriter Rich Douek, director of integrated production David Rolfe, group executive producer Amy Wertheimer, producer Annie Dietz, managing director Kirsten Flanik, global account director Susannah Keller, account director Joshua Steinman, account manager Tani Corbacho, account executive Jocelyn Choi, group planning director Annemarie Norris, senior planner Alaina Crystal, senior communications planner Sean Stogner. Filming was shot by director Lawrence Chen via BBDO in-house studio The Kitchen and Vanishing Angle with producer Matt Miller, director of photography Frank Barerra, editor Andrew Reuland, sound mixer Mike Weinstein, camera assistant Steve Smith. Colorist was Adrian Seely at MPC. Sound was mixed at Heard City by Keith Reynaud.